One of the most read and most shared article on our site is actually our materials post, which we wrote nearly two years ago. We also have lots of information requests from 3D printing enthousiasts out there regarding different material types, printer settings for specific filament types or even requests to do specific 3D printing materials reviews. 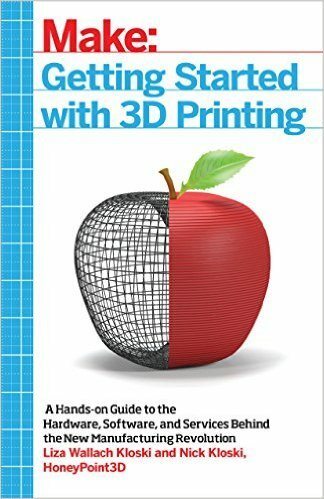 This led us to believe that there seems to be a real need to publish more information on what other materials exist for 3D printing, what can be done with them, what are their properties and specifications, etc. So we have been working on a series of follow-ups to our initial materials review, in which we only analysed the two main and most commonly available materials, ABS and PLA. The third one, PVA can already be classified as a bit more of an exotic material. Just complete this form to download a printable PDF of this post for you to keep forever! The domain of 3D printing materials development is actually one of the hottest and most interesting domains in 3D printing, as new developments are made every month. We are happy to announce that we obtained some very promising samples of new materials at the FabCon 3D in Erfurt, which we will add to our (evergrowing) testing list. We do not claim to be complete, as sourcing materials on such a big scale quickly becomes expensive and there are tons of different materials out there, but for this first in-depth review we tested the following three materials for you: BendLay, Laywoo-D3 and LayBrick. 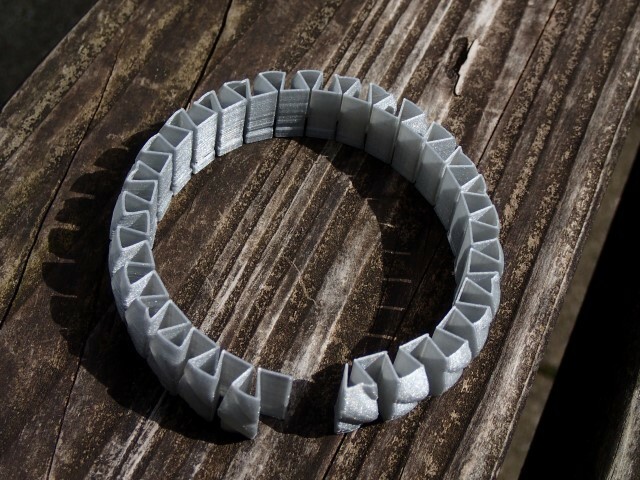 Bendlay is a development of the prolific Kai Parthy, a German engineer and absolute materials innovation guru, who also developed Laywoo-3d and LayBrick (which we have tested herebelow). His latest inventions are PORO-LAY (a two in one filament, which can be stiff or, when treated with water, rubbery) and LAY-CERAMICS, a filament whith which you can print on your 3D printer, but which you can afterwards put into a a ceramics oven in order to make hardened pottery. While those last filaments are mostly not up for sale yet, we got us a roll of BendLay, which is a translucent, tough but bendable filament. BendLay is clear like Polycarbonate (like Lexan or Plexiglass) and according to the manufacturer it is food-safe so it can potentially be used in food-packaging and medical devices. It is a modified Butadiene (like ABS), but it is warping a lot less and it has high interlayer adhesion, making it quite easy to print with. BendLay does stick very well to ABS and PLA, so it is suitable for multi-material prints. 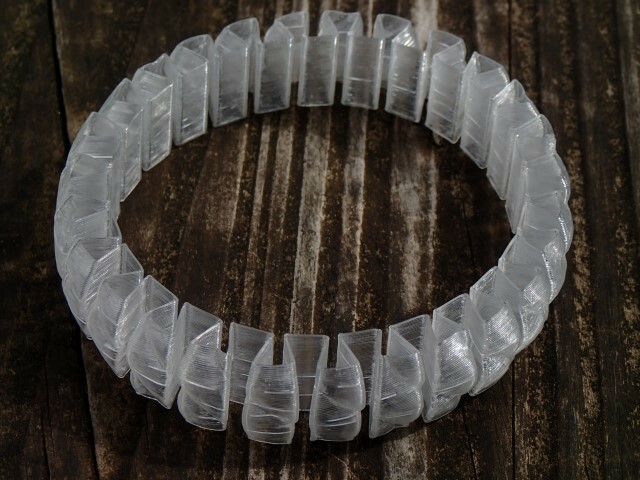 Furthermore, the manufacturer states that it is high-impact resistant and nearly unbreakable, and with a shore hardness of D65 you can bend it up to 175%. Even mistreated like this, you will not have any stress whitenings from bending. Recommended print temperatures are between 215-240°C. 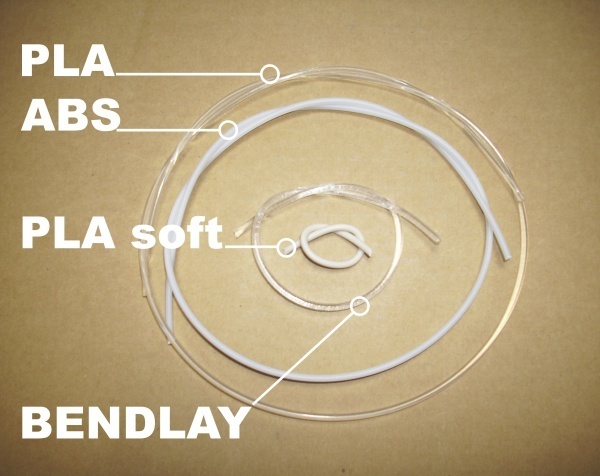 As per the manufacturer, BendLay is best used where ABS is too hard and where flexible PLA is too soft. BendLay is soluble in brake cleaner, acetone will make it crumble. The settings which worked best for us were a temperature between 225-235°C, printed on blue tape (as it can warp) at a speed around 50mm/sec. 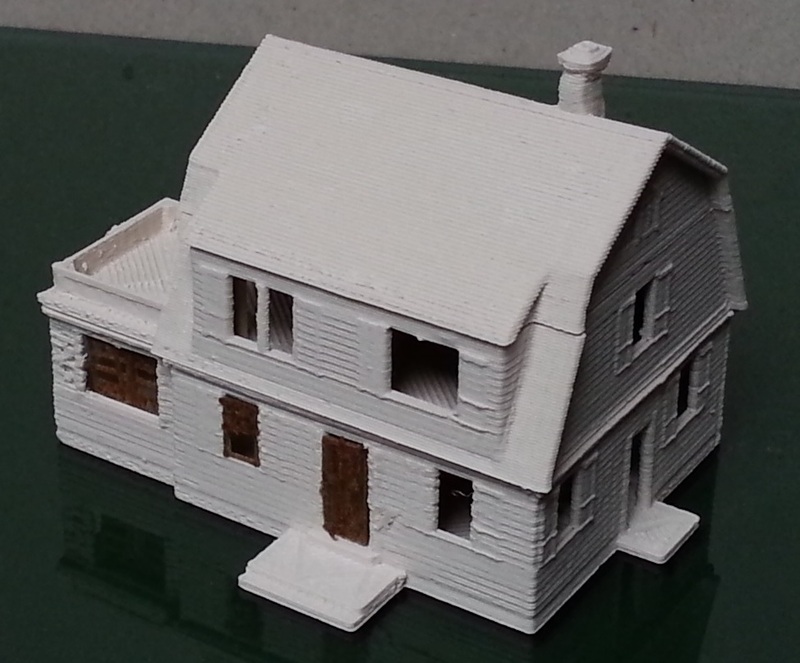 BendLay will keep its bendability if it is not printed with a too thick wall – a 100% infill or just a thick wall will make it loose this interesting property. Another property of BendLay we absolutely loved is that it is very easy to handle on the spool. You probably all had spools of ABS, PLA or nylon trying to unwind themselves, thereby creating a huge filament entanglement mess. As BendLay’s inherent property is bendability, the filament just stays on the spool, making it a breeze to handle and to feed into the extruder. We liked BendLay a lot for very specific prints, where you clearly need flexibility and where PLA and ABS are too much prone to breaking or too stiff, which is very well illustrated in the photo below. 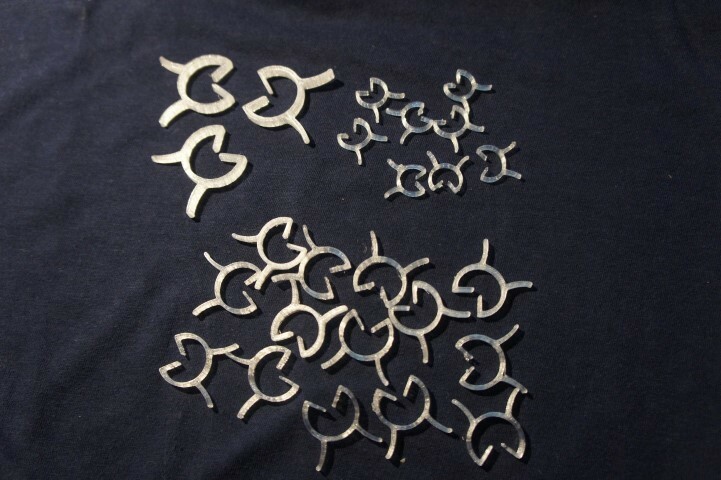 One example where BendLay performed wonderfully are these “garden clips” (http://www.thingiverse.com/make:78724), as those printed from PLA were very brittle and broke all the time. Another perfect example are the very known and widely printed “stretchlets”. You most certainly printed one of those as your first prints and may have played a bit with them. It is probable that you also came to the conclusion that they tend to snap/break, when printed in PLA or even in ABS. This is far less of an issue if you print a stretchlet in BendLay, which is perfectly suited to some intense bending and stretching. For more projects and items printed with Bendlay, just check out our gallery below. Laywoo-D3 is yet another brainchild of Kai Parthy. Laywoo-D3 (also known as Laywood) is a wood-polymer composite made from 40% recycled wood particles mixed together with some binding polymers. 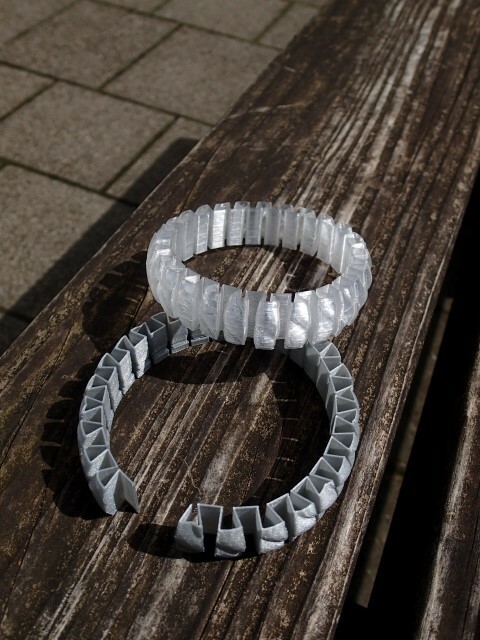 This interesting material has about the same thermal durability as PLA and, notwithstanding its “experimental material status“, it is actually quite easy and fun to print with it. It produces very unique prints with an interesting texture, so Laywoo-D3 will probably appeal most to artists and customers bored of printing just in “standard” plastic. It does hardly warp, so a heated print bed will not be necessary. 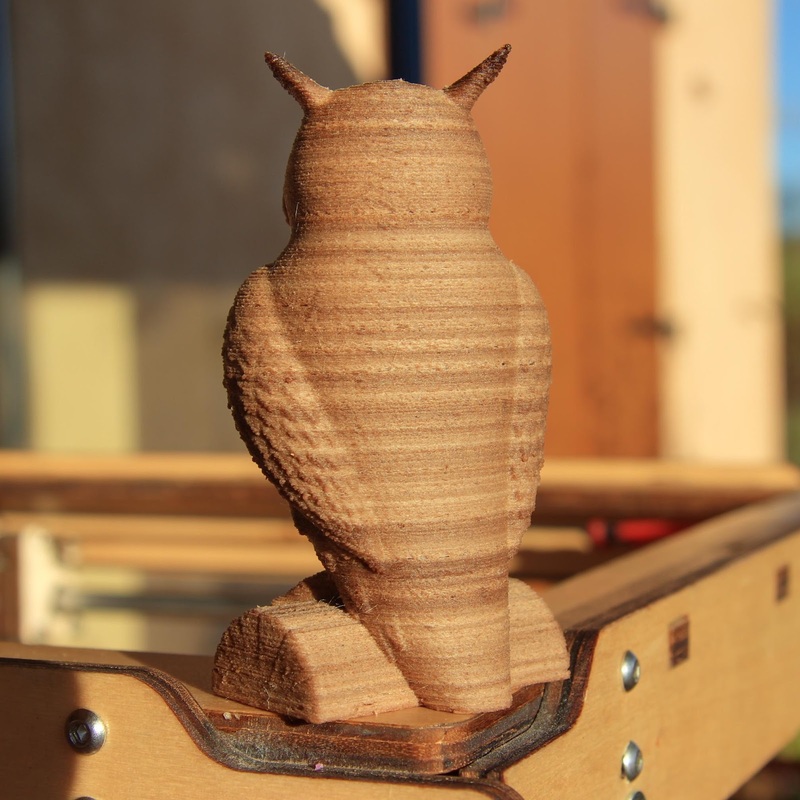 The prints actually look and smell like wood and post-processing presents various options, as the prints can be sanded, grinded and painted like standard wooden products. Please note that Laywoo-D3 is not the same then ColorFabb‘s BambooFill or WoodFill, which we will test in one of our next materials post. Laywoo-D3 is generally available in both 3mm and 1,75 mm diameters coils (not spools) of 250g or 500g and it is quite expensive (21 to 23 EUR per 250g/27 to 30 $ per 250g). The manufacturer’s recommended printing temperature range is set between 175°C and 250°C. 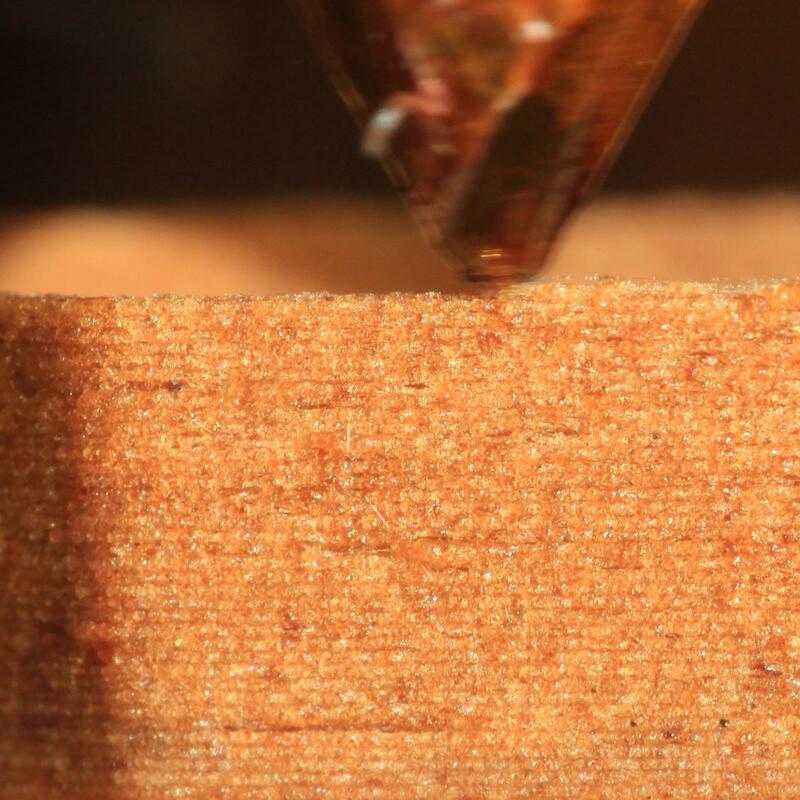 As an interesting side effect, playing with the temperature settings on the extruder allows you to obtain different finishes on the wood texture of your print. A higher temperature will create a darker color and the parts extruded at lower temps will obtain a lighter finish. 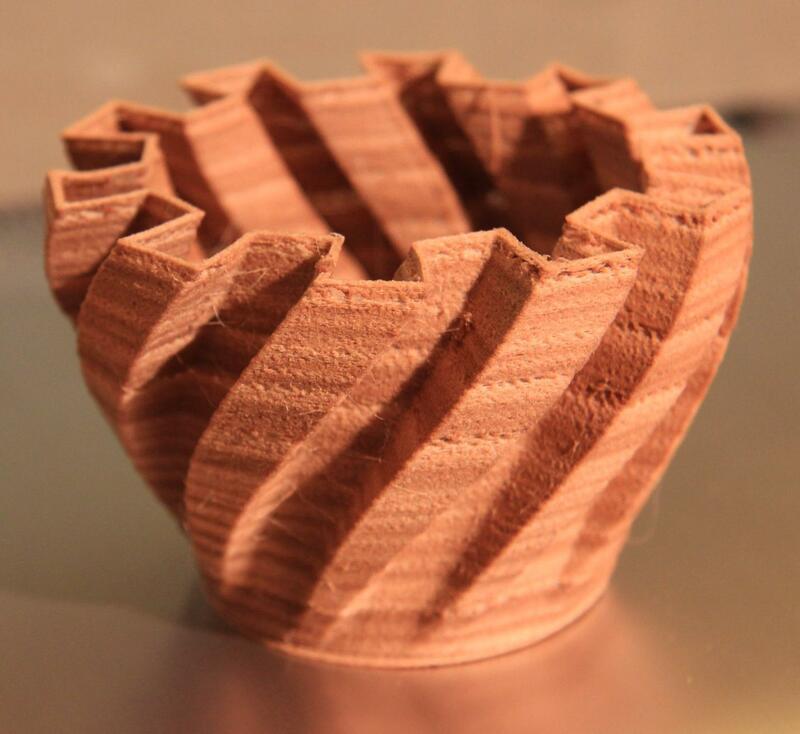 This enables you to print with tree ring-like effects, as our friend Jérémie François impressively demonstrated when the filament was still in beta-testing. 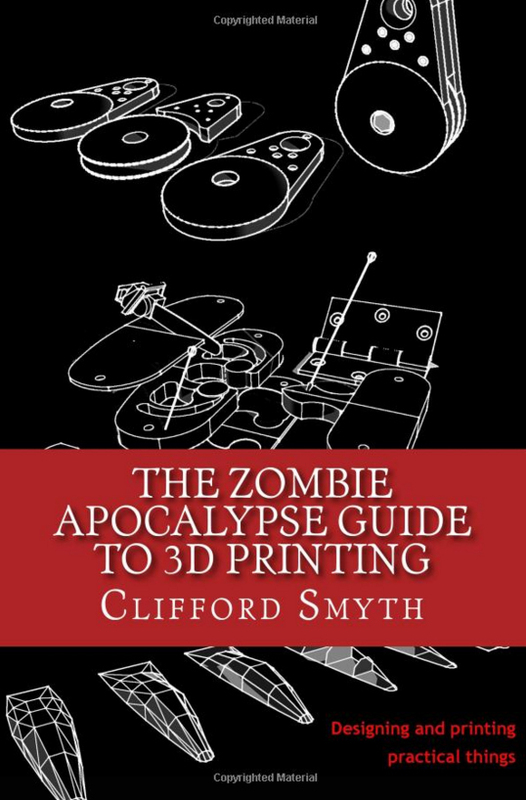 His articles on printing with wood and on the different wood gradients obtainable with this filament attracted so much attention that even Wired magazine published a piece on it. The Laywood filament is brittle and breaks quite easily, so you need to pay special attention when feeding it into the extruder or when pushing it into the Bowden tube (if your printer has a Bowden-tube setup). Our filament did snap when we tried to push it into the Bowden-tube. As we use the larger 3mm kind, we only can imagine that the 1,75mm filament must be a real pain to keep in one piece. Also, do not try and re-spool the coil in a tighter radius then the one supplied, as it will break. Actually, in order to avoid any potential entanglement (which all end in breaking the filament) and breaking issues, we recommend that you print a specific spool for this filament, which can be found on Thingiverse (http://www.thingiverse.com/thing:39564). 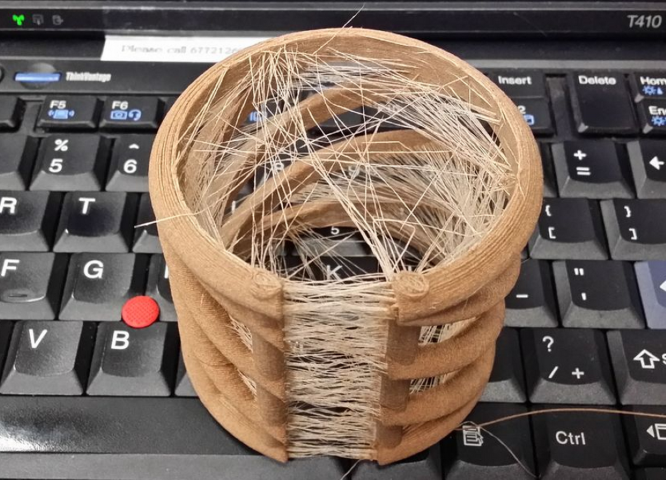 Here’s another tip we got from Jérémie, so to avoid breaking the filament: put it into a cardboard box and use a hairdryer in a smooth, even and circular motion on it for a couple of minutes, but be careful not to overheat it (no more then 90°C!). This should soften it up so that the Laywoo-D3 should stay intact while putting it into the extruder. When we tested this material, we also found that it is important to make a small test print, in order to check if your extrusion rate is correct for this material. We recommend that you add some skirt lines (depending on your software you are using, 1-2 may be standard but you should increase them to 5-6 with the Laywoo-D3) before the printer starts on the object itself. If the skirt print is rough and patchy, or if there is no/little material extruded, we recommend (for the more advanced users) that you augment your feed rate, resulting in the increase of the volume of extruded filament, for the first few layers. 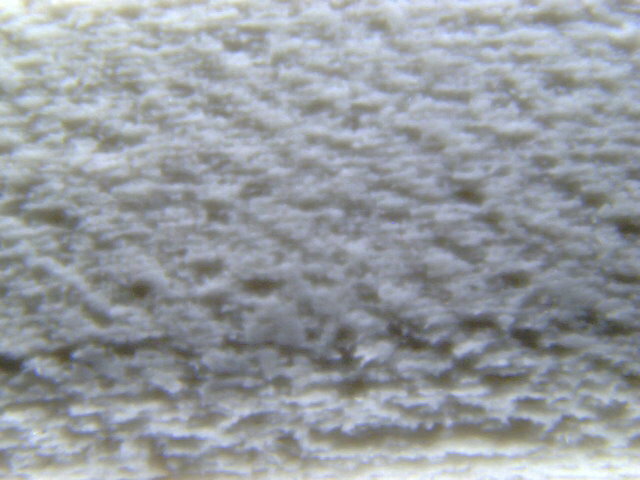 These techniques will actually prevent a so-called “dry extrusion”, which is fairly common with fibrous and less viscous materials like Laywoo-D3. The temperature setting that worked best for us was around 185-190°C. Towards the higher end of the recommended print temperatures (240-245°C), we found that the items printed became not only much darker, but also a lot rougher. So if you are looking for “smoother” prints, we recommend staying in the 190-220°C range (but this may change, dependent on your printer model and your hot-end you are using). 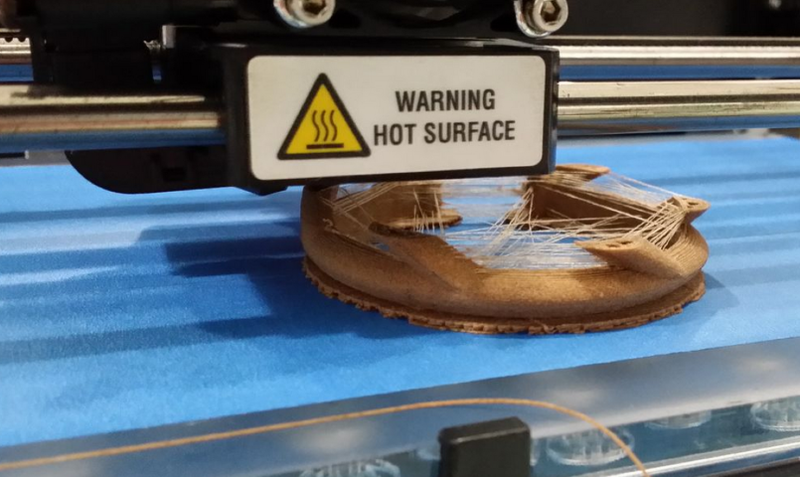 Do not remove your print immediately from the build platform but we recommend to let it rest and cool-down a bit (unless you have big and very efficient cooling fans). 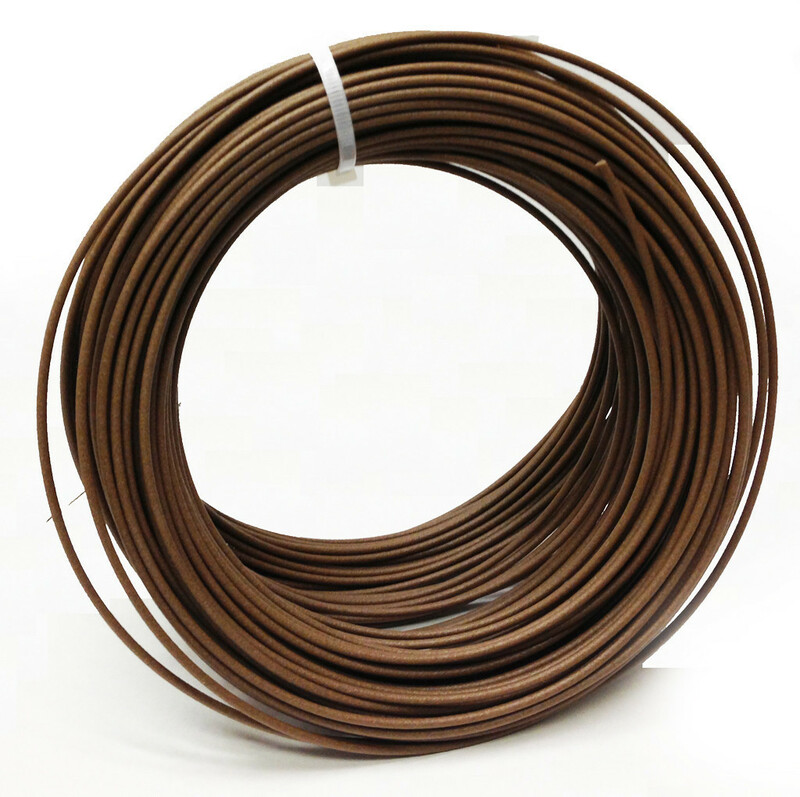 Another recommendation is to NOT keep this filament at high temperatures in the heat chamber WITHOUT any extrusion going on (i.e. heating up the hot-end for a print, but pausing/waiting before printing), as this will clog your nozzle with solid carbon. The same happens if you do not respect the max temp extrusion indications and test printing with even higher temps than 250°C. Once burnt (i.e. carbonized), the filament will be a real pain to remove! 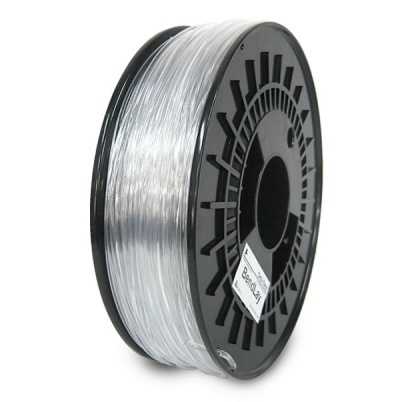 Clogging will most probably be an issue with this kind of filament, especially if you are using smaller nozzle sizes or if you are printing at low temp values. 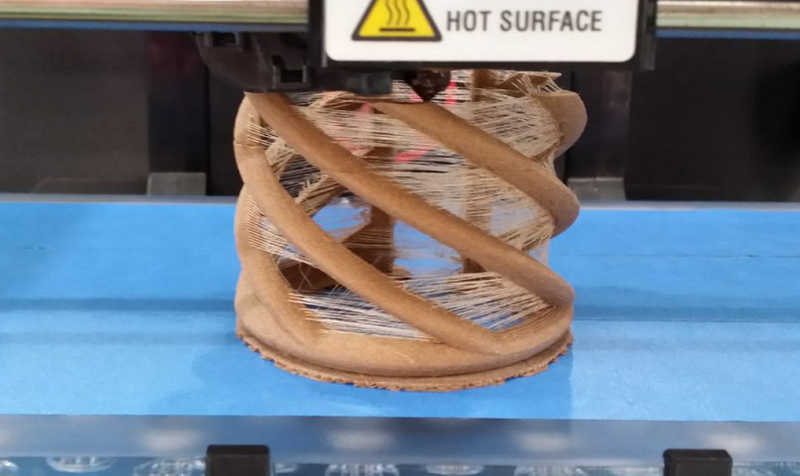 The wood fibers are very likely to get stuck in the heat chamber or in the nozzle itself and many people (especially those with printers featuring 0,35mm or smaller nozzles) had more or less serious jamming/clogging issues with all sorts of wood-filament. 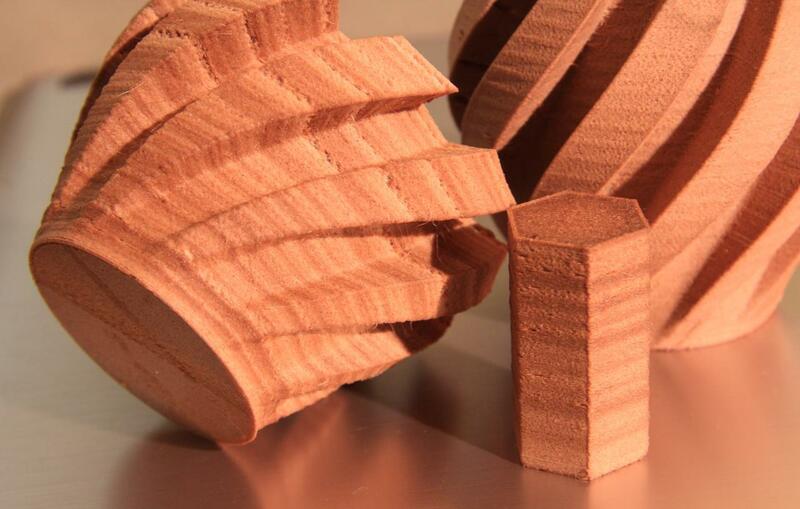 Therefore, a 0,5mm nozzle or larger is recommended for any sort of such wood-filament. 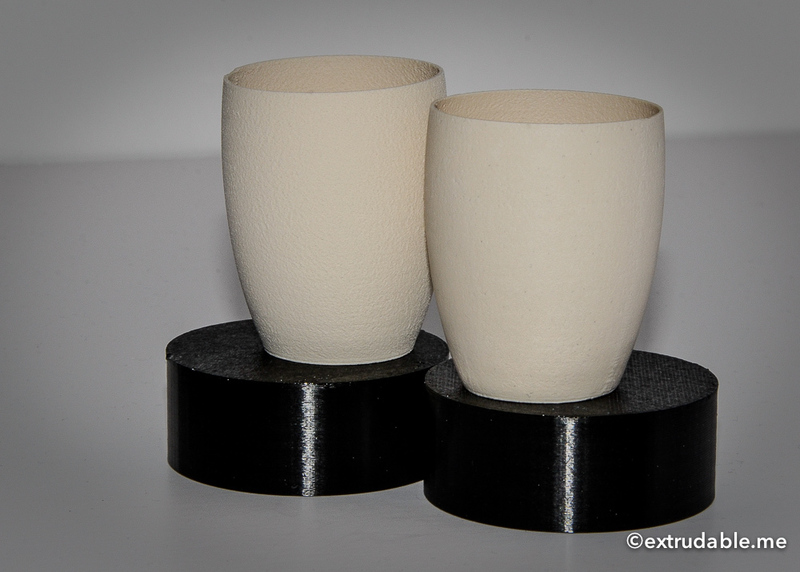 Let’s note that during our tests, we did not experience any clogging issues with our Ultimaker stock 0,4mm nozzle. 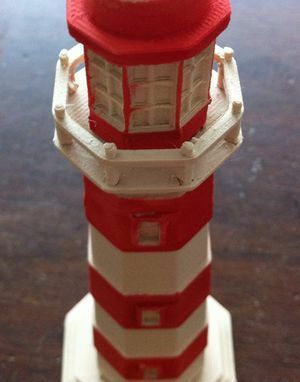 Depending on the piece you are printing, you may also experience some stringing issues. 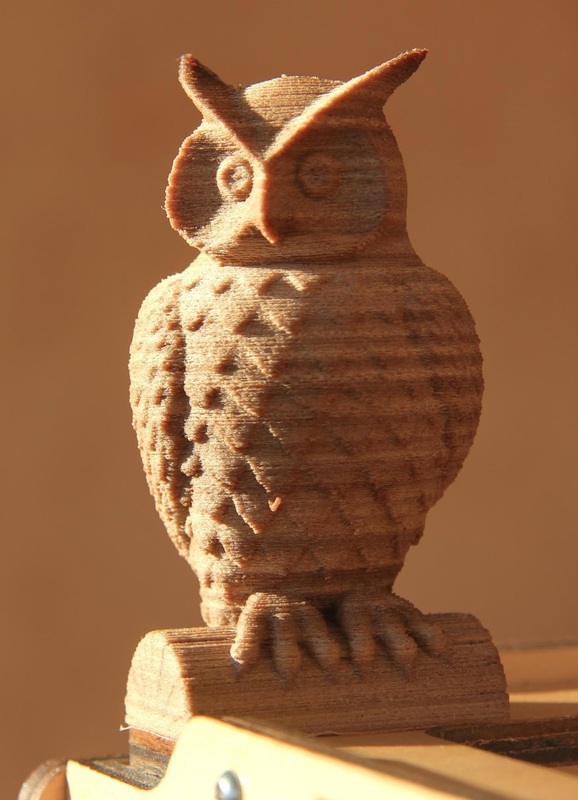 It may be recommended to slightly augment your standard retraction values when printing with Laywood or you just post-process your printed piece with a Dremel or similar tool. Our final recommendation is that you purge every time, after you finish printing with Laywoo-D3, the filament leftovers in the heat chamber with some fresh PLA or ABS. We generally install a roll of ABS (considering that the Laywoo-D3 can go up to 250°C, we prefer ABS in this specific case), heat up the hot-end to 250°C and immediately extrude between 70 and 100mm of filament, so that no wood-fibers remain in the heat-chamber or the nozzle. You may consider this a waste of material, but do not underestimate the hassle of cleaning a heat-chamber or unclogging a nozzle, or in some cases, the price of having to replace them. If you keep to this simple habit of purging after using a specialty filament, the chances that any excess filament and fibers may cause a clogging or that you will need to buy a replacement nozzle will be very slim to none. Prone to clogging – ALWAYS purge after printing! Laybrick is also a German filament engineered by the very innovative Kai Parthy (we just love the materials this guy invents!). Before going into this filaments specifics, let us first clear up some of the more obvious misunderstandings about its properties. This material is neither made of clay, nor of concrete, as some people seem to think. 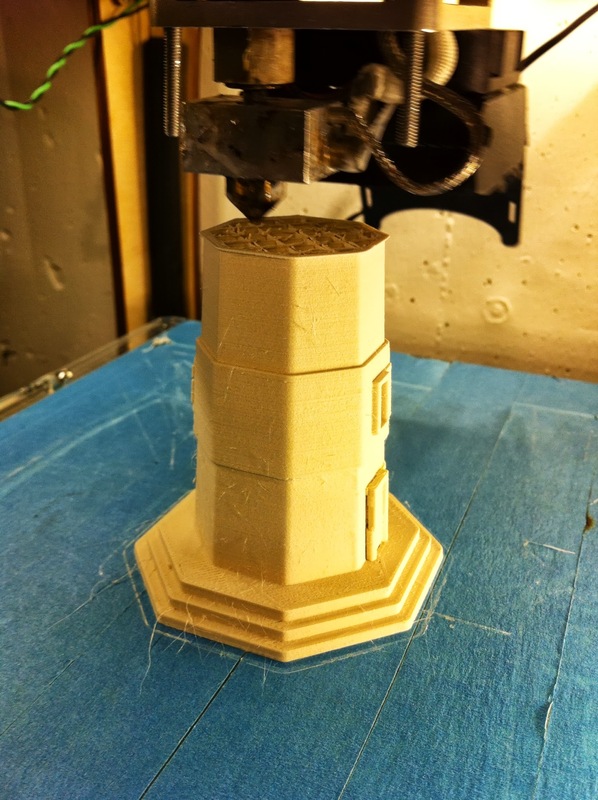 The finished print can (depending on your print settings) look sandstone-like, but the filament itself is not made out of sandstone! Laybrick is a mixture of very finely ground/milled natural minerals (like super-fine powdered chalk) which are mixed together with co-polyesters (i.e. a thermoplastic). It is a very novel and incredible material and we loved printing with it so much, that we actually declare Laybrick one of our top 3 favourite 3D printing filament types. 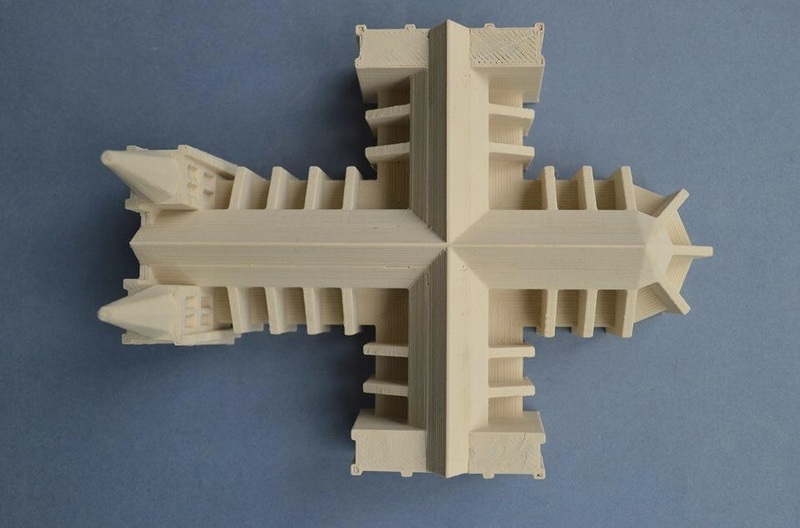 As every kind of experimental 3D print material, Laybrick is quite expensive. As of this writing, it is sold in 3mm and 1,75 mm diameters coils of 250g which cost around 22-35 EUR / 28-45$ per coil. Laybrick is quite easy to print with, as is does nearly not warp at all, so no heated print bed is necessary. 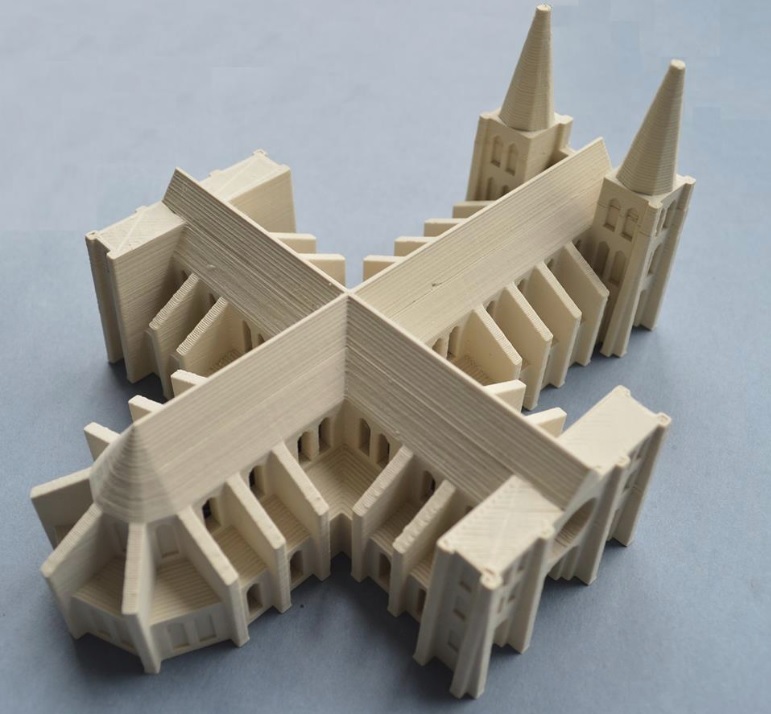 The prints realized in Laybrick kind of have a ceramic look, ranging from smooth to rough, coarse and grainy (depending on your extrusion temp chosen), with a color spectrum going from greyish-white to slightly beige. As Laybrick is still sold as beta-test filament (i.e. it has experimental material status), the colour you get may be of a different nuance then a previous batch. Contrary to Laywood, playing with the temperature settings of your hot-end will not make Laybrick change its color, but higher temps (and speeds) will however directly affect the prints texture. The best description of how this texture can be, has been described by illuminarty, whose excellent article on printing with Laybrick we strongly recommend reading. He describes that the texture a Laybrick print takes can range “from a fine, barely discernible eggshell grit up to the slightly abrasive sandstone finish“. 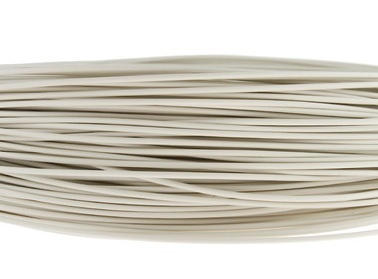 The filament manufacturer’s recommended temp settings range between 165° and 195°C. The general rule with Laybrick is, that the lower your extrusion temp, the smoother your print will become. If you use higher temps, the texture changes to a sand-stone like grain. In order to get a better idea of this effect, just check out the photo by illuminarty below. Printed items all have a “a slightly warm, natural feel that is not at all like plastic“, statement which we can fully support. From left to right – 165ºC (very smooth and detailed, but with slight under-extrusion); 40mm/s at 180ºC (smooth and good detail, properly extruded); 60mm/s (sides) and 30mm/s (top) at 200ºC (rougher texture on sides and less precise infill of top); 60mm/s (sides) and 30mm/s (top) at 220ºC (again noticeably rougher side texture and sloppier top with less precise details). 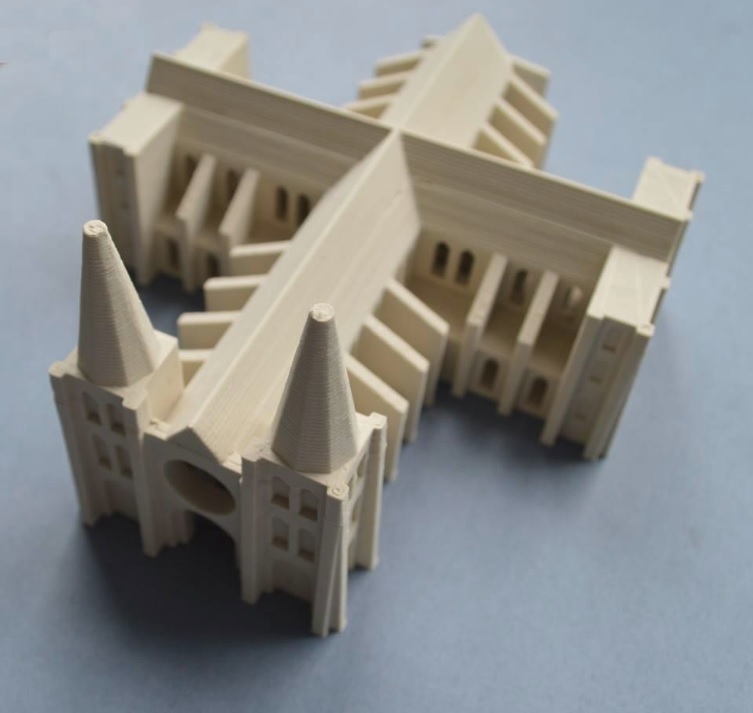 Printing with Laybrick will not only appeal to material freaks like ourselves but also to a lot of creative people, artists, architects and other professionals likely to use 3D printing in their professional activities. According to the manufacturer, Laybrick is perfectly suited for big to jumbo prints and one of the areas where it probably will be most used in are large architectural models, sculptures, bowls or landscapes. Post-processing proves being easy, as the items printed with Laybrick can be grinded, sanded and also painted, although we did not try that out yet. Sanding (only do manual sanding, as machine polishing leads to melted parts quickly) can make Laybrick “as smooth as polished marble” according to illuminarty. He also recommends using isopropyl alcohol to soften the printed item’s surface. Laybrick dissolves in alcohol, so using a brush dipped in IPA on the prints outer surface can smoothen out burrs or blobs. Be careful not to use too much alcohol however, as it does break down the polymer chains of the material, rendering it completely brittle over time. Do not use Acetone, as it reacts too heavily with the Laybrick filament. 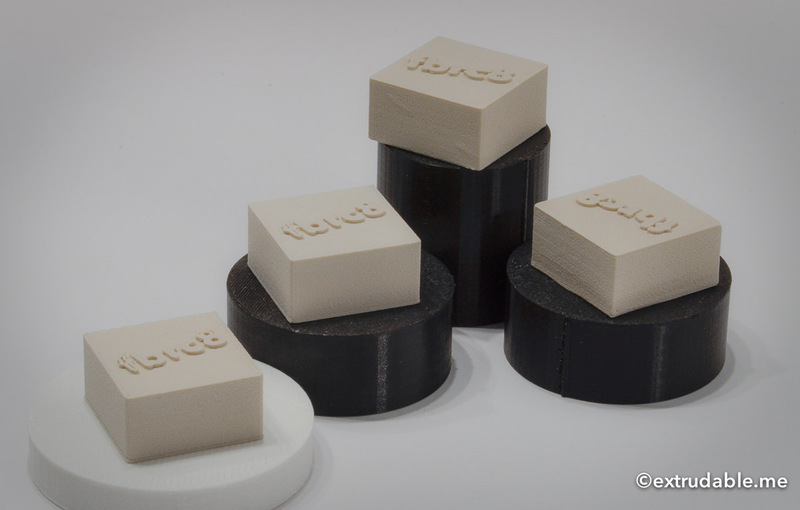 Laybrick is still sold as beta test material, so diameter variations are likely to happen. The filament is also very prone to breaking. If you think Laywoo-D3 is brittle and breaking easily, just try your luck with Laybrick. This filament is the most frail of any filaments we have ever tried, it is like trying to print with dry angel hair pasta or vermicelli pasta rods. It breaks when setting it into the extruder, it snaps when pushing it into the Bowden-tube or when you try to extract it. Our test filament even broke in 2 places inside the Bowden-tube, as the thread did not go completely straight into the extruder (i.e. it wasn’t unwound perfectly), which then created enough tension to just let it snap inside the tube. The trick against this is the same as with Laywoo-D3: just use a hairdryer on it for a bit and it should soften up a bit. Another trick is to simply print in warm rooms (i.e. over 20°C), so the filament is more bendable. This fragility makes it necessary to also take special care when removing parts from the platform, once printed. It is recommended that you leave the print for 2-4 hours, as the heat only dissipates slowly. Respecting this cool-down period ensures that your Laybrick print turns into a quite hard, stone-like material. But these small issues should not keep you from printing with this fantastic material. 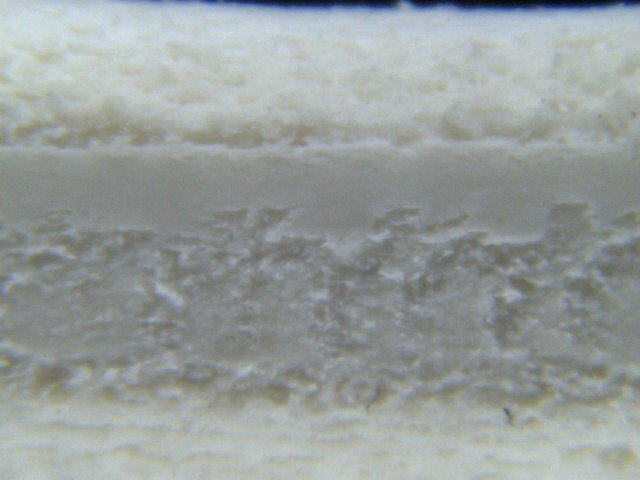 Laybrick is the first material we have worked with, which actually does not seem to produce any layers. 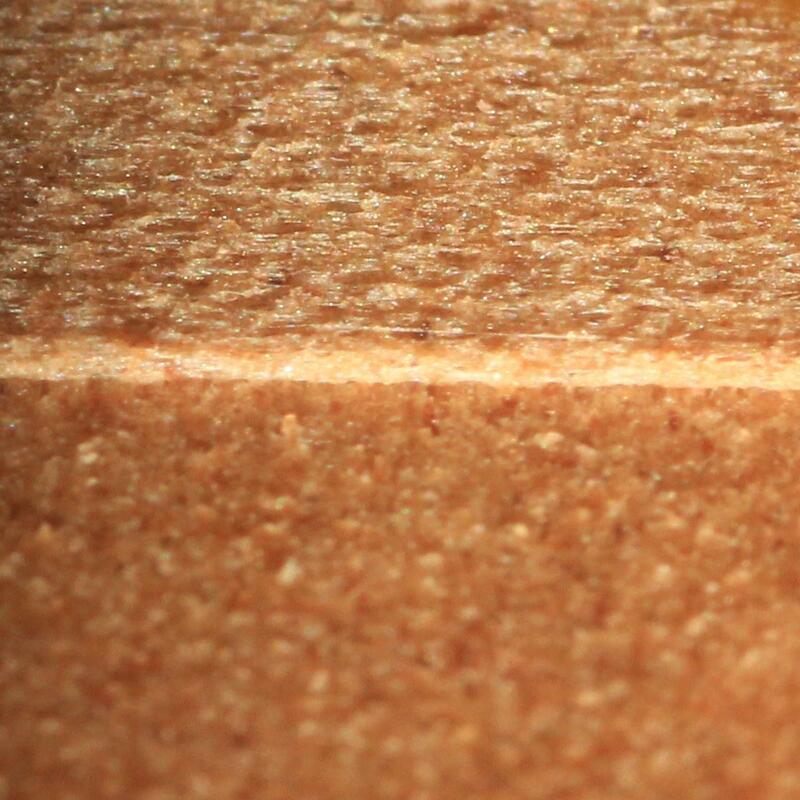 If your prints has layers, it will be because you printed with a very low resolution (0.3mm and more). Going higher then 0.15 mm layers seems to be unnecessary, as it won’t make any noticeable difference in your print. 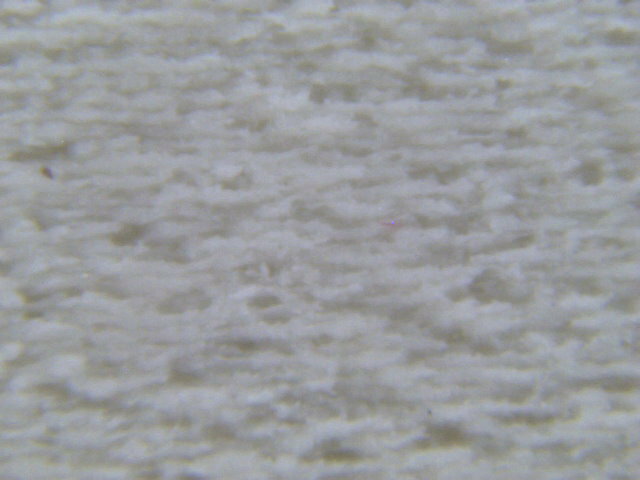 Just check out the following pictures taken via a USB microscope, to understand what we mean with: “Laybrick produces close to no layers”. Those photos are even more amazing then the interlayer macros on LayWood. As with Laywoo-D3, we recommend adding a few skirt lines, before starting your print, as this will give you an idea if you will have a dry-extrusion (and have to change the settings, cf. our comments above on augmenting your feed rate under the Laywood description) or if it does extrude just fine. Your build platform should be covered with painters tape (blue tape), as Laybrick sticks really well on that stuff. Your print should be started at a lower speed, before you can crank it up. Our first two prints did under-extrude, but our temperature setting was too low. Our ideal setting were 180°C, 40mm/sec, max fill to 25%. Also, you need to have your fans on during the print. Some people do recommend augmenting the retraction speed to 6mm and 50mm/s, in order to avoid the appearance of burrs during layer changes, although we did not experiment with this yet. Depending on your printer, you may need to add manually the code M227 to your gcode file if you are printing with Laybrick. The M227 code is called “Enable Automatic Reverse and Prime” and can look like the following: M227 P1600 S1600, where M227 is the command and P and S are steps. “The reverse and prime means that the extruder filament is extracted some distance when not in use and pushed forward the same amount before going into use again “(source: reprap.org/wiki). This will help prevent drooling of excess filament from the extruder nozzle. Laybrick may also cause some occasional clogging, but less than Laywoo-D3 (as it doesn’t burn to carbon). Please refer to our anti-clogging and to our purging instructions under the Laywoo-D3 section and do apply them also to all things concerning Laybrick. 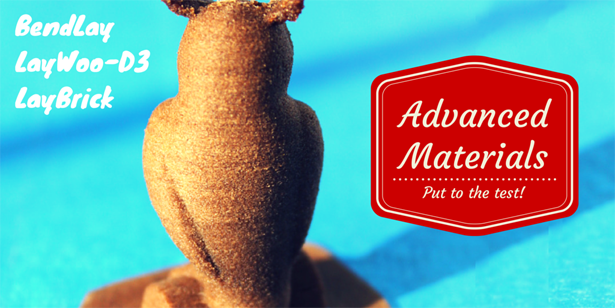 What’s your experience when it comes to printing with these innovative 3D printer filaments? Do you have any additional insights or tips that the community could benefit from? If so, feel free to share them in the comments section below. This has been taken care off 🙂 Glad to hear that you find the site useful, let us know if you have any questions.